Are you talking 'bout iPads? Cause if you are they are the dumbest invention ever. Thank You Very Much. I'll be here. It's a simple mistake to make. My PC is much better than those smarmy Mac PCs, and especially the "I'm not a laptop" Laptop. I have to disagree with you there. They ARE pretty overrated and get pretty boring after a while (luckily I won mine or else I would regret buying one) but they are good for some things. They’re really good for YouTube and books. This fits so perfectly… remembered it just after I posted that first comic. Yep. 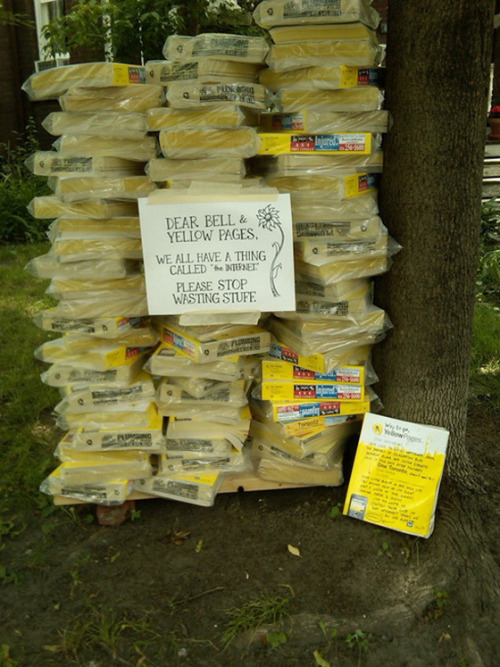 That image perfectly sums up my feelings on phone books. "Hush, I'm looking up a phone number"
Hysterical I have two phnoe books under my monitor now , I can't wait till i get 2 more in the lobby. I have no phone books, but one night my internet was down and I really needed one to find the number for my ISP's support. I called up my friend and asked him to look it up for me, and he loved every second of it: "Oh, your internet is down? Mine works fine, in fact I'm not sure I have the time to look up the number for you, I'm so busy being on the net you know.. Hmm, what to do next… Google looks nice today, I tell you.. Okay, here's the number.. The first number is a 7.. or maybe it's not.. but there's definitely a 4 in there, promise".. Took like half an hour getting the number, but at least I got to return the favor a couple of months later when his internet was down..
5! Bonus Friday! You're working too hard Adam! But now with a extra panel. This year I called YP (yellow pages) and asked to "opt-out" of receiving a YP at my condo (I was going to do it online, but you *must* give them your email address to do that, and I find that offensive). I own my condo and never again need a YP. I was told I could only opt-out for two years and after that they would automatically deliver them again. I said this policy leads to situations like having a huge stack of them that sit unwanted in apartment buildings, but YP insists that those books are, in fact, wanted. Ya know, I totally feel the same way? Luckily, I don't think we actually get the phonebook any more… either that or it's hidden from me before I have a chance to feel bad for it! hehehe panel 3 & 6 made me laugh pretty good (^-^) cant wait till mon. LOL, love the comics, I used a phonebook for an old server motherboard that inexplicably would not work in any case I put it in. It ran fine for a year until it was replaced and thereafter referred to as "the magic phone book of fixing s**t"
I tell you, Bug Comic is by far the best comic strip I've read/seen since Calvin&Hobbes. Any chance of finding a collection in a book or something? Keep up the good work! Thanks a lot! I hope to have the first book available before the end of the year. Will be looking forward to get it. Meanwhile, I'll go on reading Bug every morning. It's the best way to start the day 🙂 Keep it up! So are there any plans to market Bug merchandise? I'm pretty sure that my life won't be complete until I get a Bug coffee mug or t-shirt. I'm currently looking into making T-shirts, but I plan to eventually make all sorts of things. Definitely, definitely coffee mugs. Must. Have. Mugs. There are many websites (none that i can remeber right now) that can do this for you, just supply them a picture and choose which items it can go on. I expect it to be very easy. Please, oh, please do make a bug tote bag! Now I need to get a phone book, as my chair has one leg that's a little shorter than the others, and I can't ever properly look up a phone number when I'm on a wobbly chair! By the way, the last panel had me busting out laughing! To the other reader: iPads rock. That is all. On the plus side, if you ever have too much time on your hands take 2 phone books and overlap them a few inches and alternate pages so each page from one has a page from the other above and below it. Once they are interlaced, find a strong stuck up person and challenge them to pull the phone books apart, the friction makes this more or less impossible. I view these as the phone company going “Someday that there innernet is gunna go down, an’ then yeh’ll be sorry!” Oh phone companies, don’t ever change. When the internet goes down, I don’t think the phones are going to work.